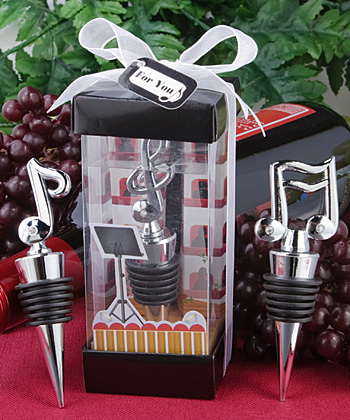 Here’s a music-inspired favor that’s a real showstopper! Sold only by Fashioncraft, each measures 4” x 1” and is made of chrome finished silver metal with a black-rubber-gasket-encircled conical base and a carved, rhinestone enhanced musical note charm perched on top - delivered in an assortment of three different musical notes. Great for anyone who has a song in their hearts, these music themed favors come standing upright in a clear vertical box with a black base and top and a clever background inside designed to resemble a three dimensional concert hall, complete with an audience, balconies, music stand, stage and lights. The box is tied with a white organza ribbon and an attached music note design “For You” tag.